66 by 54cm., 26 by 21in. Vespertina Quies (FIG 1. Tate) which translates as 'Quiet of the Evening', was painted in 1893 and depicts a young girl dressed in a gown of deep, rich blue leaning on a balustrade with the empty courtyard of a convent and mysterious mist-veiled woodland beyond. 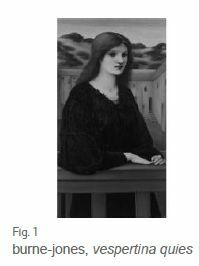 The picture has been compared with the Mona Lisa, not only for the similarity of composition but also for the enigmatic expression of the woman. The enigmatic expression also recalls that of the mermaid in Burne-Jones' only Royal Academy exhibit The Depths of the Sea of 1887 (private collection) and of the various ghost-like women in The Sirens of c.1891-98 (John and Mabel Ringling Museum of Arts, Sarasota). allowed to watch the artist as he worked on the painting. She recalled that 'He began by drawing the figure in raw umber... I think it was done before I came. Then he modelled the face in white and raw umber, lightly putting a little red on the lips, nostrils, and eyes. '(Martin Harrison and Bill Waters, Burne-Jones, 1973, p.158) It is the same technique that he used for this delicate study for the painting and for an oil sketch for Sibylla Delphica painted c.1885 (Cecil French Bequest, Hammersmith and Fulham Libraries). 'used Bessie's face much in his later work - she succeeded her mother as chief 'angel' and 'nymph' - and he produced one beautiful portrait of her; actually a portrait, though he called the picture Vespertina Quies.' (William Graham Robertson, Time Was: The Reminiscences of W. Graham Robertson, 1931, p. 282) Vespertina Quies was perceived by the critic Frederic Stephens to be a pendant to Burne-Jones' portrait of his daughter Margaret entitled Flamma Vestalis of 1886 (Collection of Lord Lloyd Webber) both pictures depicting young girls dressed in black-blue. The fact that the young woman in Vespertina Quies was depicted playing nervously with a ring on her finger and with a convent courtyard behind implies that her emotions are conflicted and that she is deciding between marriage and celibacy. Similarly Flamma Vestalis depicts a melancholy vestal, caught in a world somewhere between Heaven and Earth but not entirely in either. 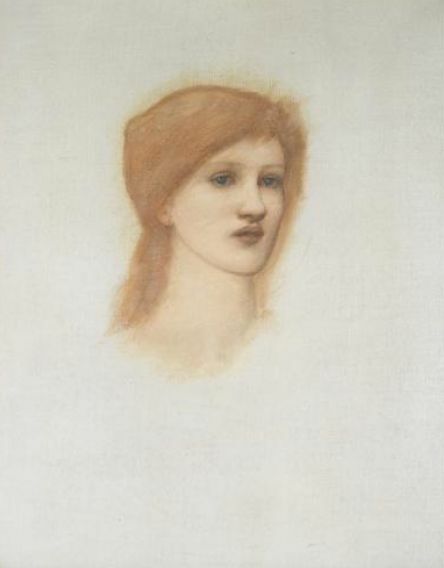 I *love* Edward Burne-Jones' work and am most interested in his life so thanks for this piece. i am currently doing a little research into the links between him and the dramatist couple Joseph and Alice Comyns Carr. BJ is fascinating,self-taught and yet such a talent. I can't help you with the conections as I only know the basics, though again they sound really interesting. Please let me know if you post about it.